King Midas, Rumpelstiltskin, and the Goose that laid the Golden Egg– these are myth and fairy tales that speak to gold and greed. There is a long association between the two. In these stories the pursuit of gold led to heartbreak, death, or an ironic killing of the gold machine. Some sort of destruction followed greed. Storytellers and writers have valued these stories enough to keep them alive for centuries. Like Neil Young’s singer kept searching for a heart of gold, a miner for a heart of gold. I’m not sure if he ever found it. There’s the literal and the figurative, the fact and the fantasy. By post 184 you are well aware of my preference. There are several reality shows on television based on gold seeking. They celebrate the pioneer spirit of Americans who are chasing the rags to riches story in our highly technological world. It’s ironic that gold remains central to our economy and technology after thousands of years. It seems to exist in the exact right proportion to be both essential and difficult to come by in relationship to humankind’s ever expanding wants. It would not surprise me if the next mother lode is discovered on Mars and that Martian gold would draw humans deeper into space just as it drew explorers to the New World in the 16th century and Americans to California in the 1850’s. Gold seems to bring out the best and worst in humans. On the one hand its beauty, malleability and conductivity have been creatively exploited for many good purposes in art and technology and medicine. On the other hand its undisputed value as hard currency has fueled man’s greed for millennia. Gold has been used to glorify God in cathedrals, but the greedy human pursuit of gold is a story of blood, death and enslavement. 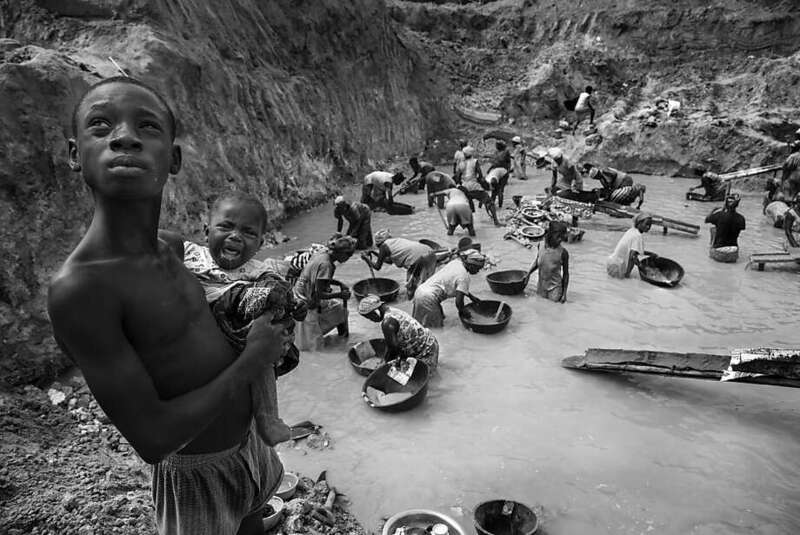 For instance, African gold today is evidence of modern slavery. It is extracted from that tragic continent by imprisoned miners under the hardened gaze of armed guards. It makes me cringe to think that the value of this metal is held so much higher than the human lives expended to obtain it. I don’t even like to consider how much human misery was compelled by the production of my wedding band or my wife’s jewelry. But I’m not focusing on real gold mines today. Rather, I’ve been thinking about the golden veins that run through the wrinkled gray quartz of our minds. Jackpot memories and associations that wind about in the neural wire mazes of the brain contain some of the same gold qualities that are in play here– purity, conductivity, beauty, malleability. Which brings me to Nelson Mandela, a gold mine of a human being. (He was the same age as my father, who would have been 95 this year. ) Why would a white kid from the suburbs of D.C. care about a Black African political figure? Probably for the same reasons that I cared about Martin Luther King, Jr. domestically. He was another gold mine in my mind. Something was wrong in our world, not just a little wrong, but drastically wrong like raging cancer. It had to be amputated from the body of civilization or else a limb, a tribe, a continent would die. And these two men stood up to it with truth and light and laser faith, like skilled miners in the depths of the earth. They were underdog Davids versus monstrous institutional Goliaths. They operated surgically with words as their scalpels, cutting up the well defended giants who had every advantage. A five year old could see the injustice of apartheid but a fifty year old could not… because that older man had grown up in the soupy illogic of inherited racism. If you cook facts under a steady low flame of ignorance, over time all the elements will cook down and mix together into something else, which I believe is institutional racism. Isms become so familiar and warm and sticky, they are as hard to get rid of as pine sap on one’s hands. Turpentine can cut the grip of it, but the smell, like the smell of blood, lingers. Both wise men avoided cooked down political soup slop, and instead deconstructed the garbage they were fed by the authorities of their day. They bored through the walls of inequality, discrimination, and apartheid on separate continents with similar intensity. They never met, though MLK tried to get a visa to visit South Africa in the early sixties. No surprise, he was denied access…the light was not permitted in the darkness by those invested in the darkness. By the time Mandela spoke to the U.S. Congress in 1990, Martin Luther King, Jr. was long dead…killed by that same low flame of ignorance. Branded as a communist, an anarchist, a rabble rouser, a puppet of darker forces. Funny how villains of propaganda become heroes in truth. Propaganda is fool’s gold; truth is real gold to the wise. It always seems to be that tragedy polishes and refines the gold in our lives. A worm eaten frame of injustice around a haloed saint seems to make that halo brighter. A dark veil makes you squint all the harder for the rays of light that pierce the crosshatched fabric behind it. Then quite dramatically one day the veil burns to ash. Freedom is all the sweeter and brighter and glorious after a long absence. The Berlin Wall crumbled under the sledgehammers of free people. Two systems had met on that line– democracy and totalitarianism, messy truth versus controlled lies. It always seems to go this way… when our love of truth and freedom is not held responsibly, in rushes fear driven deceit and ever escalating control. When that totalitarian control is finally shucked off, what glorious joy the newborn truth radiates. Wise men don’t wait for injustice to celebrate the truth. They don’t require any prison term to enjoy their freedom. No, with each breath they inhale truth and exhale joy, following God’s star.